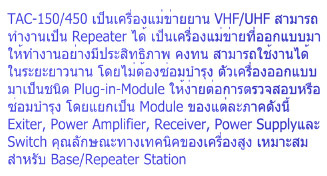 TAC-750/450 are Professional VHF/UHF Base & Repeater Staton, High Reliable and Long Life equipment, the units are designed in plug-in-module concept for easy checking and servicing, they are Exciter, Power Amplifier, Receiver, Power Supply and Switch Radio specification is high selectivity etc. It can be racked in cabinet. Easily configured for Duplex, Simplex, etc.